In addition to the Teachers’ Choice Award, MobyMax received the 2017 SIIA CODiE Award for Best PreK/Early Childhood Learning Solution and Best Cloud-Based Solution earlier this year. The company also won EDDIEs from the 2016 Education Software Review (EDDIE), garnering awards in an unprecedented four categories: Best Multi-Subject Website (Early and Upper Elementary), Best Multi-Level Website, and Best Teacher Tools. MobyMax was also a 2017 EdTech Digest Award Finalist for Best Personalized Learning Solution, and Best Special Needs Solution. A Teachers’ Choice Award from Learning Magazine is a hard-won accolade. For the 2018 Classroom program, 23 winners were chosen based on their evaluation scores from a panel of teachers across the country. 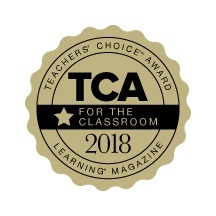 For over 20 years, the Learning Magazine Teachers’ Choice Awards have heralded the very best in classroom-tested, teacher-recommended products. Each year, a nationwide panel of teacher-judges names the standouts in books, classroom supplies, educational games, websites, and more—everything you need for your classroom. For more information, visit www.learningmagazine.com. MobyMax, the nation’s leader in personalized learning curriculum for grades K-8, unlocks the power of personalized and blended learning to help students learn twice as fast. The company offers the only complete and comprehensive K-8 curriculum for 28 subjects, including math, reading, phonics, language, vocabulary, spelling, writing, science, social studies, and state test prep. MobyMax finds and fixes learning gaps to help students increase one full grade level in just 40 hours. MobyMax’s comprehensive solution includes diagnostic testing, assessments, progress monitoring, IEPs, student response system, whiteboard activities, and student motivation prizes, badges, and games. For the 2015-2016 school year, MobyMax was in active use in 73% of all K-8 schools in the United States. Teachers have trusted MobyMax with more than 22 million students. MobyMax envisions a new reality in which every child in every school in every country learns as fast as if they had the best teacher in the world sitting beside them. MobyMax’s mission is to create a global, research-powered curriculum that enables every child everywhere to learn twice as fast.